Web Domain Taken? Get Inspired By These 15 Outstanding Domain Names #Infographic ~ Visualistan '+g+"
As a business owner, you started with a great business idea. You worked hard to launch your business. And you even picked a clever business name to support your memorable brand. After investing countless hours, months, or even years into your business, you may feel a lot of pride for and protectiveness of your business. Now, as you venture into the online world, you find that the perfect domain name, www.yourbusinessname.com, is already taken! Don’t let your frustration get the best of you; it’s time to get creative. 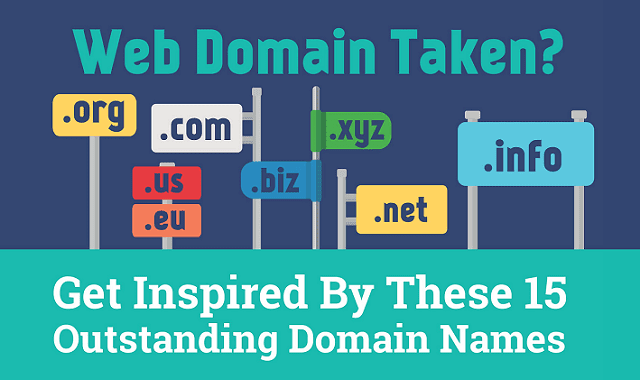 Take a look at these 15 outstanding examples of original domain names, and apply these patterns to your own business name. 1) Add a unique domain extension. 2) Use a double meaning. 3) Make a play on words. 4) Include a great brand story. 5) Build off your personal name. Ultimately, you need to keep searching until you find that special domain.